Yarcombe and District Young Farmers are a charitable organisation for the young farming and local community in the surrounding areas of Yarcombe. The club was founded in 1947 and since that date we have been running strong as one of the biggest clubs in Devon. 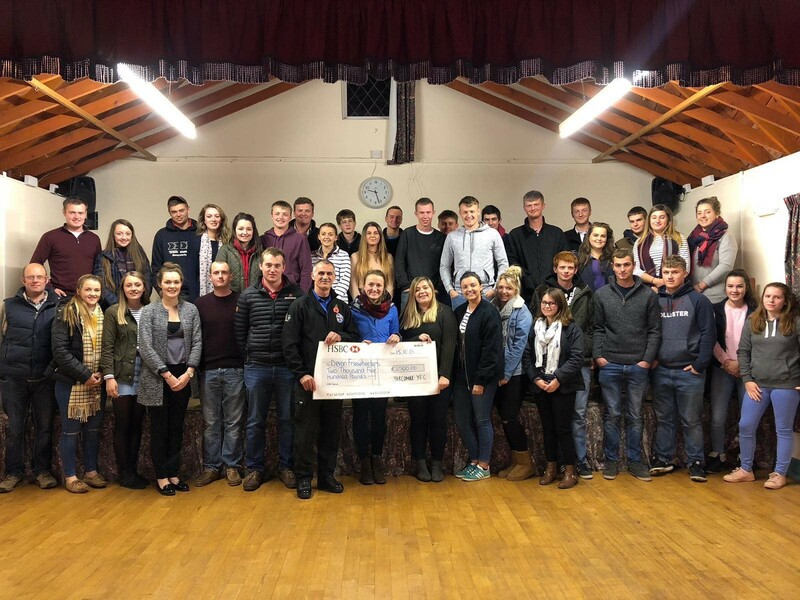 Members are between the ages of 15 to 27 and take part in many activities within YFC including public speaking, stock judging, charity fundraising, sport, acting, many social events and skills for life activities. Over the past years we have held many of our own events including our annual foam and water parties, charity duck race, fancy dress raft race, bingo, harvest supper and much more. Members have been on scholarships to many different parts of the world, entered many competitions and gained lots of skills. Ultimately we are a club of likeminded young people who have lots of fun! The start of March saw the much-anticipated South West Area Activities weekend with around 40 members heading to Weymouth. 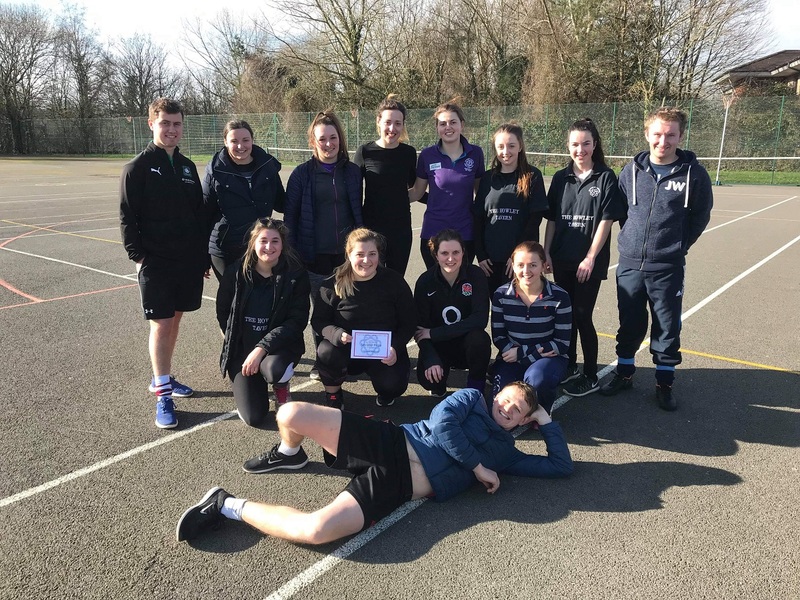 We had a team competing on behalf of Devon in the mixed netball competition, who managed to successfully win and will now go on to represent the South West at the national finals later this year so a huge well done to them!! A coach load of members attended Whimple & Broadclyst YFCs ball held at Crealy Adventure Park, where an enjoyable night was had by all. Yarcombe Hall Committee held a fundraising wine and wisdom, where we had a couple of teams take part. Members have also continued enjoying competing amongst other teams across East Devon in skittles, pool and darts with varying success. Coming up we will be holding our annual show and sale, this year joining alongside other clubs from Devon, at Exeter Livestock Market on Wednesday 24th April. Prior to this we will also be holding our dairy heifer show, which will be judged on farm. Good luck to all those competing. If anyone has any further questions please contact Chairman Robert Dyer on 07552 743600 or Secretary Rosie Turner on 07713 124884. February saw the club perform our re-run of our entertains production �Selfie� at Axminster Guildhall � a huge thanks once again must go to Sam Parris who helped to produce this year�s production. The production was followed by additional entertainment from assistant Chairman Dan Olive, who presented Yarcombe�s very own Family Fortunes. Thank you to everyone who came along and supported the event. Members then took part in a club social night bowling in Taunton, before then competing in the county bowling competition at Exeter where we managed to come a fantastic 3rd out of all the clubs within Devon, so well done to all who took part. On Friday 22nd February we held our annual whist drive at Yarcombe Village Hall which was well supported, with the highest male being chairman Robert Dyer, and highest lady and overall highest score going to member Sarah Broom. Thank you to all who helped to support this event. On Sunday 24th February Sarah Broom and Emma Dyer performed with other members from across East Devon, in the county choir competition where the team managed to come a fantastic 2nd, and having great fun along the way. Members have also been busy playing skittles, pool and darts against other clubs across East Devon, to battle for a place in the county final. They will also be attending the South West Area of Young Farmers Weekend in Weymouth where we have a team of mixed netball players competing against other clubs from across the south west � good luck to the team! Coming up on Friday 19th April we will be holding our first barn disco of the year by kind permission of the Hine family in Combe St. Nicholas (Frog Lane Farm, TA20 3HQ) 8pm-1am. We have started off 2019 as busy as any other year. Most of our time has been taken up with rehearsing for our entertains production of �Smartphone� which we performed at the end of January at the East Devon round of the Entertains competition in Exmouth where we came 5th. Also, that weekend Emma and Robert Dyer took part in the Senior member of the year competition, having to answer questions on stage in front of the audience, following an interview held earlier in the month. Congratulations to Emma for coming 3rd in a tightly fought competition. Also, well done to Molly David who came 4th in the junior member of the year competition where the standard was very high. Alongside all of this we have also found time to fit in a lot of sport. First up, we had the girls� 5-a-side football which we managed to win at both the East Devon and County round! We also had 2 teams enter the group mixed netball where both teams successfully came 1st and 2nd. We then went on to the county round where we managed to come a brilliant 2nd. Huge congratulations to all members for their sporting success! At the start of January, David Laramy enjoyed a week away with the National YFC Ski trip to Belle Plagne in France � a great opportunity that was thoroughly enjoyed. Coming up we also have members performing in the East Devon choir team, who by the time of reading this will have competed at the county round in Barnstaple at the end of February, so good luck to all involved. Christmas through to the New Year is always a busy time in the YFC calendar and this year was no exception. We kicked off the festivities with our Christmas meal, this year held at the York Inn, Churchinford, at the start of December. This was followed by turkey plucking one evening at the Hines in Combe St. Nicholas in order to help raise money for this year's charities - members managed to help pick 70 birds in total. We decided to do things differently this year at our Christmas meeting, combining it with our skittles throw off, with members donating money to charity in order to play, followed by a buffet. Once again, our charity carol singing was hugely successful on Friday 14th December, where we were able to raise well over �400, again for our chosen charities for the year ahead. Emma Dyer also represented the club by doing a reading at Yarcombe Church�s carol service. Many members enjoyed dressing up in their black-tie attire to attend both Devon and Marshwood balls in the run up to Christmas, celebrating the season in style, and later in the Christmas to New Year period the club enjoyed a social day out to Taunton Races where some were luckier than others! Alongside all of this, members have been busy preparing for the upcoming entertainments competition at the end of January, as well as Emma and Robert Dyer competing in the Senior member of the year, and Molly David competing in the Junior member of the year competitions, so good luck to all of those involved. We will be performing a re-run of our entertainments production, on Sunday 17th February, 2pm for 2.30pm start at Axminster Guildhall. Also coming up we will be holding our annual whist drive on Friday 22nd February, at Yarcombe Village Hall, 7.30 for an 8pm start. November has been yet another busy month for the club, we kickstarted the month by helping commemorate 100 years since the end of World War 1. We supported Yarcombe�s �Thank You 100� event on Saturday 10th November by helping to provide the bar. On the Sunday we then laid a wreath at the church service. Also this weekend Emma Dyer represented East Devon at the county round of After Dinner Speaking where the team came a brilliant 3rd place in a tightly fought competition. This month members also paid a visit to Harry�s Cider based near Langport where members were fortunate enough to have a look around the orchards and cider making facilities, learning more about the process from apple to bottle. The winning netball team went on to compete at the county round coming a fantastic 3rd place so well done to all who took part. At one of our meetings we were pleased to be the first club in Devon to undertake the Rural + training, a session derived from the National Federation of Young Farmers Clubs, aimed at increasing members� awareness of mental health conditions. It highlighted the importance of us all talking about our mental health and being more aware of rural isolation. We once again held a successful wine and wisdom in Yarcombe Village Hall, which was well attended, helping to raise money for our 2 chosen charities for the year ahead: NEST: Newborn Emergency Stabilisation and Transport Team and Exeter RD&E Intensive Care Unit, both charities close to the club's heart. The club is looking forward to a busy festive period, and if anyone has any further questions please contact Chairman Robert Dyer on 07552 743600 or Secretary Rosie Turner on 07713 124884. October has been another busy month for the club, starting with our AGM and election of new officers where it was great to see lots of people taking on new roles. Thank you to last years team and we wish the new officers every success in the year ahead. New chairman and secretary Robert and Rosie went to an Officers Training Weekend in Okehampton organised by Devon YFC to learn more about their roles. We had a team enter the final speaking competition of the year: After Dinner Speaking, with members creating speeches on Model Railways and Police Officers. Emma Dyer was selected to go through and represent East Devon at the county round where the team managed to come 3rd. We held our Halloween disco at Yarcombe Village Hall on Friday 26th October, which was well supported, and it was great to see lots of people embracing the fancy dress theme! We held our new members meeting the following Monday where it was great to welcome lots of new members, and we played some games at the end to help everyone get to know one another. At this meeting we also welcomed Dave Cook from Devon Freewheelers who spoke to us about the amazing work they do, and we were fortunate enough to be able to present him with a cheque for �2500! This money has been gratefully received by the charity. On Sunday 4th November we had 2 teams playing at the East Devon round of the netball which we managed to WIN so well done to everyone who played. We were also pleased to be able help support the "Thank You 100" Celebration party in Yarcombe Village Hall by helping run the bar on Saturday 10th November. Members look forward to the upcoming busy Christmas period with lots on in the programme. For further information on Yarcombe & District YFC, please contact our Chairman Robert Dyer on 07552 743600 or our Secretary Rosie Turner on 07713 124884. September marks the end of our young farmers calendar year and the changeover of officers moving forward. It has also been the month for the start of speaking competitions with two teams from Yarcombe taking part in Brainstrust on the 2nd of September. Well done to the junior team who managed to come 2nd place (Peter G, Daniel S, Will V and Jack R). It was decided this year to donate �2500 to each of our chosen charities. Emma Dyer and Claire Johnson visited Bristol Children�s Hospital on Tuesday 18th where they learnt the ward we were donating to looks after children with neurological conditions, or who are recovering from brain surgery. The money will go towards refurbishments that are currently underway on their rehab ward for patients undertaking a longer stay. Devon Freewheelers, our other charity are going to come along to a monthly meeting in the near future to receive their money and provide us with a talk about what their work involves. This year�s harvest supper took place on Sunday 23rd Sept at Yarcombe village hall. Thank you to all members for making the night a success and run so smoothly. A special thanks to Pat Tomlinson our guest speaker for providing an interesting speech about his role in agriculture. Well done to all prize winners on the evening and thanks to all our advisory and parents for continuing to support us. On the 29th Emma D, Chloe W and Emily S took part in the ready steady cook competition at the Malvern Show. This was to represent Devon YFC at the National cookery finals. The team came a respectable 19th place out of 35 teams that entered. With nothing left to report I would like to say a massive thank you to everyone for the continued support to Yarcombe YFC every month and particularly this year. August is always home to the ever famous Honiton Agricultural Show, which is a big event in the East Devon YFC calendar. This year held on the 2nd of August several members entered a variety of classes, supporting team Yarcombe. A huge thank you goes to Kelly Nichols for all her time put into the club cubicle which came a respectable 6th place and to Louise Johnson whose scrapbook and promotions board for the club both came 3rd place. Not only an enjoyable day, members got to attend the �after show dance� that evening and Hontion YFC�s twilight ball on Saturday the 4th. We once again did the bar at the Yarcombe terrier races on Saturday the 4th. This made a profit of �1164.77 which was decided to be split, donating �600 to Yarcombe church and the rest to charity. Thank you to Yarcombe community for their continued support and we hope all members of the public had an enjoyable evening with their dogs! On Friday the 10th we held our annual foam party at Reads Hill Farm, Chardstock by kind permission of the Burrough family. With a bar, BBQ and disco the event was set out to be a good evening, however was unfortunately called short due to an incident beyond our control, whereby an over 18 attendee hit her head on the concrete floor. Due to these unforeseen circumstances and the emergency services being called it is likely that this event will make a loss in profit but will be subsidised by the amount of supplies we have left over to use at our next event. Thank you to all our advisory and club supporters for helping us deal with the situation on the evening. 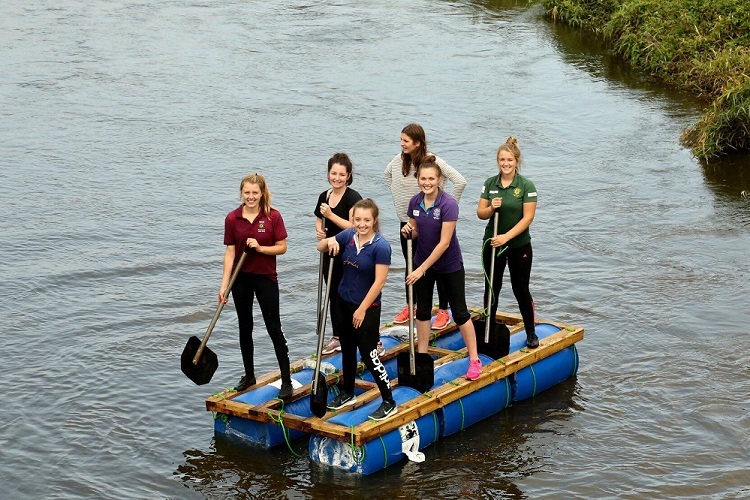 We finished the month off with the most enjoyable day, a raft race from Whitford bridge to Colyford. Yarcombe YFC held the race on bank holiday Monday 27th August with an amazing 14 teams taking part and all crossing the finishing line. Well done to the team of Yarcombe boys who completed the race in the quickest time and to the team from Axminster YFC for winning the best fancy dress element. Total profit made on the day was �281. For more information about Yarcombe & District YFC contact our chairman Richie Barnes on 07519353652 or our secretary Emma Dyer on 07462344587. July was kicked off for Yarcombe YFC with a current vs old members cricket match held at Upottery Cricket Club on Sunday 8th July. This was a scorching hot day so congratulations to all who played until the very end. Twelve members managed to complete a charity bicycle ride the following weekend, on Saturday 15th July, cycling 10 miles in total. This consisted of following a route around the local area and stopping at half a dozen pubs along the way. Thank you to members of the public who donated and supported the event as they saw us on their travels. All money has gone towards our chosen charities this year. We finished the month off with a charity cream tea held on Sunday 29th July. The event was held at Birch Oak Farm, Yarcombe by kind permission of the Parris family and two of our senior members, newlyweds Jenna and James Parris. We would like to thank them for letting our club use their beautiful marquee. Around 300 people turned out to support the cream tea, despite the weather not being on our side a great afternoon was had by all. Congratulations to all members and advisory that donated and baked all scones, cakes and raffle prizes sold on the day. We managed to raise around �1400 to go towards, Devon Freewheelers and Bristol Children�s Hospital Neonatal Ward. June has been a quieter month for Yarcombe YFC, with members participating in their own farming activities and enjoying the glorious sunshine that we have been having. Eleven members went to Clip �n� Climb rock climbing in Exeter on Monday 11th June where they were taught to use all the climbing wall facilities and harnesses. An enjoyable evening was had by all. We held our annual water party on the 29th June, this year with the added extra of a warm water pool. With over 460 people supporting our event we made a rough profit of �4500 to go towards our chosen charities, Devon Freewheelers and Bristol Children�s Hospital. A massive thank you to everyone that helped us with this success, our club leaders and advisory and particularly the Barnes� family for hosting the event. We look forward to our annual foam party on the 10th August. Congratulations to two of our senior members, Christina Turner and James Waller who tied the knot at Yarcombe Church on Saturday the 16th June. We wish them a lifetime of happiness. We carried out our community project on the 13th May at Yarcombe village hall and churchyard. Around 15 members turned out to re-paint the village hall shipping container and lay a path in the churchyard. Others help to trim the hedges and clean out the guttering around the perimeter of the church. A big thank you to the hall committee for providing us with lunch and refreshments, a very productive day was had by all. Yarcombe YFC also entered Devon County Show, held on the 17th � 19th May. Members entered individual crafts, cookery and floral displays. The club entered their annual cubicle, this year themed as �Magic & Mystery� which came a respectable 8th place. As well we presented a club scrapbook which came 4th place. A big well done goes to Emma Dyer and Chloe Webber who took part in the Ready Steady Cook competition against other clubs in Devon. The two girls came an amazing 2nd place, congratulations. Five members headed down to the Devon YFC Field day to see what it was all about and had an enjoyable evening at the after party. Good to see our club supporting these extra organised events. We are currently looking forward to the next couple of months, with a few Yarcombe events coming up. Our pool party is being held at Stopgate Farm, Yarcombe on the 29th of June. We are also holding a charity cream tea on Sunday 29th of July at Birch Oak Farm, Yarcombe by kind permission of the Parris Family. It would be great to see members of the community supporting this event. A busy month for Yarcombe YFC. On the 15th April Liam Dare and Peter Grabham both took part in the East Devon stock judging day, representing the club and managed to come an overall 3rd place. Well done to Peter who managed to win the junior dairy class. We held a successful disco at Yarcombe Village Hall on Friday the 20th April with 130 people attending. All the money raised will go towards this year's chosen charities. A massive thank you to our advisory members who helped on the evening. Yarcombe YFC held their annual show and sale at Sedgemoor Market on the 28th of April 2018, by kind permission of Greenslade Taylor Hunt. We had an outstanding number of entries with 24 lots of ewes and lambs, 17 British blue steers, 11 pairs of pigs and 11 dairy heifers. The overall show champion was awarded to Dean Parris with his Holstein dairy heifer. These were judged on farm by two judges who went round and visited them. Huge congratulations also goes to Oli Hine who came overall reserve show champion with his British blue steer at the market. A well presented beef animal with great formation. Other winners included, Scott Retter with his four ewes and seven lambs and Scott Burrough with his evenly matched pair of coloured pigs. Beth Johnson won the heaviest bullock trophy with a steer weighing 845kg, topping the market at �1505. A massive thank you goes to all our judges for supporting the club and choosing winners from such a high standard of stock. Also thank to our show and sale secretary Kate Burrough, the day would not have happened without her. We also held our annual ploughing match on the 29th of April, at Hugginshayes Farm by kind permission of the Dare family. Congratulations to Peter Grabham, winner for a second year in a row and Scott Retter for winning the novice entry. Unfortunately the beginning of March was a disappointing one for the South West YFC calendar. South West Area Activities weekend was cancelled due to the adverse weather conditions the country had been faced with. For many members who were due to be staying in Weston-super-mare on the 2nd to join in the fun and activities it was very annoying. The competitions were however re-scheduled to a later date, and a massive well done goes to Robert Dyer who got through to the southern area finals of the �Just a Minute� competition coming a very respectable 3rd place. Some of our members attended the group talk on Dairy farming efficiently for better returns at Kentisbeare Village Hall. An interesting talk was given and they learnt from the experienced speakers at the event. Over 60 people attended the annual Whimple & Broadclyst Spring Ball at Crealy Adventure Park, Exeter. A great night was had by all and a great effort from Yarcombe for supporting the event in such a big way. Our show & sale of cattle, sheep and pigs is fast approaching and our show secretary, Kate Burrough has been busy organising the event as well as an evening meal to present the awards afterwards. Thank you to her for being so organised and we look forward to the 28th of April. For more information about Yarcombe & District YFC contact our chairman Richie Barnes on 07519-353652 or our secretary Emma Dyer on 07462-344587. February has been a very sporty month for Yarcombe YFC, with many east Devon competitions taking place. To kick off the month two teams were entered for 5-a-side football on Tuesday 6th at Cullompton where we came a respectable 3rd place overall. We also played ultimate Frisbee on Sunday 11th where the team again came 3rd place. Dodge ball was up next and to top it all off we managed to come 3rd place again! Skittles has begun and is in full swing, going well with Yarcombe yet to have lost a match. Fingers crossed this is our sport. This month we have also held our whist drive which was on Saturday the 17th at Upottery Village Hall. We had nine tables altogether with some members taking part which was great to see. Thank you to Roger for being the evenings� MC and also to Dan Olive for all his effort organising the event. Additionally congratulations to Emma Dyer our club secretary for being one of the winners. Some members attended the East Devon YFC beef and sheep talk at Kentisbeare Village Hall on Tuesday 20th February. This turned out to be a very informative night with some good speakers. Well done to them for supporting something a little different and getting involved. January came around way too quick and the YFC festivities ended too soon. For nine members they continued to have a fun time on the Devon YFC ski trip, this year to Val Thorens, France. This was held on the 6th � 13th of January and I can safely say the snow did not disappoint with many inches falling from the sky every day. A great week was had by all and thankfully nobody returned home with any injuries! January was also home to our East Devon pantomime competition, held at Exmouth pavilion on the 19th and 20th. Yarcombe performed our version of Cinderella on the Friday evening and a great crowd came down to support us. After constant weekday evenings of practicing non-stop it was a great relief for the team to finally perform what they had created. We managed to come a respectable 3rd place out of the 5 clubs that competed. A massive thank you goes to James Burrough for producing our show and pulling us all together over the past few months. Junior and senior member of the year was also held at Exmouth pavilion on the Saturday evening alongside the pantomime competition. Well done to Liam Dare, who came 1st and Sarah Broom, who came 3rd competing in the senior member competition. Liam went on to represent East Devon at the county round on Saturday the 3rd of February where he managed to come a brilliant 5th place. Peter Grabham and Scott Nicholls took part in the junior member of the year competition and came 2nd and 4th respectively, so a big well done to them as well. This month we have heard of the sad passing of one of our Honorary Lifetime Presidents, John Salter. He was a founder member for Yarcombe YFC when the club was first started up and his continued support and huge contribution has been greatly appreciated by the club always. He was also greatly involved in the local ploughing matches around Yarcombe and started the famous terrier races, both of which are support by YFC. It was amazing that John was still around to celebrate the clubs 70th anniversary last summer and was honoured to cut the cake at our celebratory Sunday lunch. We cannot thank him enough for supporting Yarcombe YFC throughout his lifetime and would like to say our thoughts and wishes are with his loved ones at this very sad time. December has been a very busy and ever festive month for YFC. We started the month off on the 8th of December with our annual Christmas meal, this year held at the Flintlock Inn, Marsh. 48 members sat down to a three course meal and enjoyed a fun filled evening with lots of drinking. Also that weekend we went turkey plucking on the 10th at the Hine family�s farm to raise money for charity. The club managed to pick a total of 71 turkeys in the couple of hours that they were there. Well done to everyone that went. Our next event in the December calendar was carol singing on the 15th. We did a pub crawl around the local area, including the York Inn, Churchingford, The Candlelight Inn, Bishopswood and Sidmouth Arms, Upottery. We raised money by donations from the public for our chosen charities. We have also attended our fair share of balls this month as well. Around 90 members headed down to the Matford Livestock Centre in Exeter to Devon YFC Christmas ball on the 16th. We also attended Marshwood Vale Snow Ball @ Freshwater Holiday Park on the 22nd. Two very fun packed and enjoyable nights were had by all, thank you to Emma Dyer our club secretary for organising such a large bunch of us. Finally this month, our pantomime practice has been well and truly been in full swing in order for our competition on the 19th of January. A huge thank you to James Burrough for producing the show and making sure we are ready for the big night. Well done to all the cast for your excellent dedication to practices and scenery preparation. I hope that everyone had a very Merry Christmas and best wishes for 2018. It�s beginning to look a lot like Christmas and the YFC calendar is busier than ever. Looking back on November it was also a jam packed month. We started off with East Devon debating on the 1st November with team Yarcombe coming a respectable 3rd place. One of our members, Rosie Turner also got selected to go and represent East Devon in the Devon round on the 11th at the Devon Rural Hub, Cheriton Bishop. Also on the 11th around 35 other members headed to Lye Cross Farm, Bristol for a farm tour of their cheese factory and dairy farm. A great time was had by all and a very informative tour was given. Massive thank you to the Alvis family for inviting us and to Alex Stevens for helping to organise the event. Sunday the 12th November held the East Devon girls netball competition in Honiton. Yarcombe came 1st place and were through to the Devon round on the 19th where they came 4th. Well done to all girls that took part. East Devon rugby team also competed on the same day where they came 1st place. Well done to Winston Perry from Yarcombe for taking part in the team. On the 18th around 70 members headed to Junction 24 for Somerset County Rodeo Ball. A fantastic night was had by all and it was great to see Devon YFC supporting other counties events. To finish the month we held our annual wine and wisdom evening in Yarcombe Village Hall. Twenty five teams entered the quiz with current and past members taking part. Thank you to Cathy Derryman for being the quiz master and Dan Olive our social secretary for organising the event a respectable profit was made. October has continued to be a busy month for Yarcombe YFC, starting with our cheque presentations to our chosen charities for this year. A massive total of �3000 pounds was raised. We chose to support three charities, Exeter hospital and Musgrove Park hospital neonatal units and Over the Wall. All three were seen as important and close to the club in some ways. The money was raised through our summer barn disco on the 12th May, annual foam party on the 11th August, charity bike ride and Christmas carol singing. Over the Wall gave us a talk about how the charity uses therapeutic recreation to help children and their families with long term conditions overcome emotional barriers that often come hand in hand with having a long term illness. We presented them with a cheque for �1000. One of our members took a cheque for �1000 to each Exeter and Musgrove neonatal units. This money will go towards getting a Neopuff Resuscitation Unit which helps to take over the breathing of premature babies to protect the delicate lungs. Also this month we have had the Devon �Just A Minute� speaking finals on the 12th October, where four of our members were chosen to compete from the previous round. Congratulations to them for being part of the winning East Devon intermediate team! Also congratulations to Robert Dyer for being chosen as a member of the team going to the next round at south west area. County mixed hockey tournament was held on Sunday 5th October. A total of 15 teams took part within Devon with Yarcombe coming an impressive 4th place. Pantomime practice is well under way in preparation for January�s competition in Exmouth. Many members are taking part this year and it is great to see many new faces getting involved. A lot of dedication and hard work is put into making such a big performance, a massive thank you to James Burrough for producing our show. October has also held our Halloween Disco on the 27th. We held this in Yarcombe village hall and members from across the county attended. There was a great turnout for the club and a decent profit was made towards our new charities. Thank you to members of the advisory and members of the club for helping on the bar and door. To finish the month Kelly, Lauren, Sarah and Emma kindly agreed to go down to Exeter Cathedral on Saturday the 28th to help decorate East Devon�s nominated pillar in a harvest theme. This was towards the harvest festival service that was to be held that week. Well done goes to them for fabulous decorations and helping East Devon to win. September is one of the busiest months in the young farmer�s calendar with both our annual harvest supper and AGM being held to finish off the year. The middle of the month also hosted the East Devon YFC �Just a Minute� competition on the 20th of September whereby team Yarcombe came 1st place at the Sidmouth Arms Upottery. Four of our members were also selected to go through to the Devon county rounds in October, a massive good luck to Emma, Richie, Jack and Robert. Additionally the best male and female speakers of the night were awarded to two Yarcombe members, congratulations Richie Barnes and Emma Dyer. Our harvest supper was held at Upottery village hall on Saturday 23rd September. Members helped to serve a wonderful cold meat salad for past and present members alongside family and friends. A massive thank you went to them for all their help in and out of the kitchen preparing and especially to Kate Hopkins for organising the event. Another thank you went to our guest speaker, David Mitchell of Mitchells Chartered Accountants for his very entertaining speech. A number of trophies were awarded on the night for achievements throughout the year, a total of 16, including sports cups, ploughing match winner, most loyal member and best entertains actor/actress. The next day, 24th September one of our members, Sarah Broom headed to the Malvern Show to compete in the National Floral Arts Final. She came a fantastic 8th place on the day in the intermediate class. A huge well done goes to her for entering. Finally to finish the month our AGM was held in Yarcombe village hall on the 25th September. Many members turned out to the meeting and the election of who our new officers would be took place. Thank you to all members for being so enthusiastic to get involved in the club this year and to take on new roles. We look forward to the next year ahead with our new chairman, Richie Barnes secretary, Emma Dyer and treasurer, Jack Burrough. August has continued to be a busy month starting with members helping run the bar at Yarcombe Terrier Races on Saturday 5th August. A successful evening was had by all and we have been able to donate �600 to Yarcombe Church. We also hosted our annual foam party on Friday 11th August at Hill Shed, by kind permission of the Broom family. The event was very well attended with all having an enjoyable night. Massive thank you to Kate, Dan and all the members that helped with the event, and to the advisory for helping with the bar and BBQ. Members have also been taking part in the East Devon speaking competitions. Senior and Intermediate Brainstrust took place on Thursday 17th August at Awliscombe Village Hall. We had a team participating in each competition, with the Intermediate team coming 3rd and the Senior team coming 5th. Well done to all those who took part! As we move into September, the new young farmers year begins and therefore on behalf of the club we would like to say a massive thank you to Liam, Sarah, Anton, Kate and all the other officers for all their hard work over the past year. It has been a fantastic year with plenty of events across the year, sporting success with the men�s football and a superb weekend in June celebrating our 70th Anniversary. Good luck to Richie, Emma, Jack, Dan and their team for the upcoming year. 23rd October: New Members Meeting at Yarcombe Village Hall, 8pm. For anyone interested in joining young farmers, come along and find out more about what we do! The club undertook their community project for the year at the beginning of July. Members helped to paint the inside of Yarcombe Village Hall on Sunday 16th July. Thank you to members Liam, Sarah, Emma, Peter, Andrew and to George Pigeon, Susan Parris and Diana Dyer for helping. Additionally, 25 members took part in a charity cycle ride around the local villages on Saturday 22nd July. Members cycled approximately 12 miles starting at the Howley Tavern stopping at the Candlelight Inn and The York before finishing at the Sidmouth Arms. The cycle ride raised �160 to be put towards the donations to the club�s charities this year � Exeter and Musgrove Hospitals� Neonatal Units and Over the Wall. Numerous members had entries for Honiton Show, with several first and second place prizes so well done to all those who entered. Also well done to Liam Dare who won the Overall Points Cup for Men! The club cubicle had a theme of British Farming which came a fantastic 2nd place, well done to Emma Hurford, Lydia Hartnell and all those involved. The club�s scrapbook also came second and the promotions board in third place. For more information about Yarcombe & District YFC contact our Chairman Liam Dare on 07854404821 or our secretary Sarah Broom on 07557514453. Yarcombe and District YFC celebrated their 70th anniversary with a weekend of events on the 23/25th June. The weekend started with the Anniversary Ball on Friday 23rd June at Hugginshayes Farm. Over 500 people attended the black tie event with money raised going towards our charities for 2017: Exeter�s Neonatal Unit, Musgrove�s Neonatal Unit and Over the Wall. Attendees danced to The Lateshift and Your Perfect Night, were served food by the Sidmouth Arms, Upottery and drinks by Heywood Bars. Then on Sunday, a celebratory lunch was held with 400 past, present and future members attending. 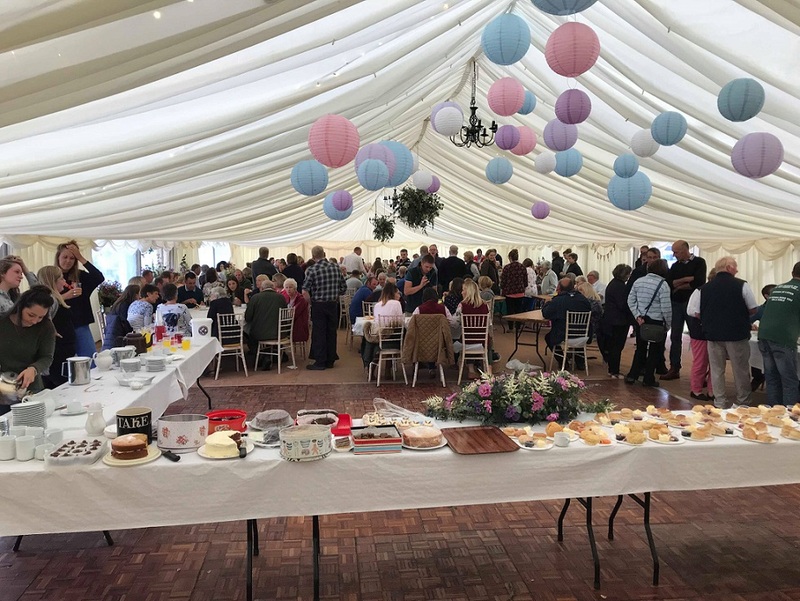 Attendees enjoyed a 2 course lunch by Cottage Caterers followed by speeches including from the guest speaker James Morrish (Kivells Auctioneer and former Activities Chairman of National Federation of Young Farmers). A commemorative photo was then taken by Martin Smith Photography of the Chairmans, Secretaries and Treasurers of the past 70 years. A thoroughly enjoyable weekend was had by all those who attended. A massive thank you goes to all those who supported the weekend, current and past members, families and friends who gave up their time to help prepare for the weekend events and made sure everything ran smoothly. The club is in such a strong position because of the people supporting it and without the support we would never have been able to celebrate the 70th Anniversary in the way we did. Additionally, on the 2nd of July, the men�s 5 a side team travelled up to Stafford for the National Final. The boys came a fantastic 3rd so well done to the squad � David Laramy, James Vinning, Matthew Broom, Neil Parris, Oli Hine, Robert Dyer and Tom Olive! 11th August Yarcombe YFC presents their Annual Foam Party at Hill Shed, Stockland Hill. By kind permission of the Broom family. 23rd September Harvest Supper at the Manor Rooms, Upottery. More details to follow. The young farmers' summer officially started on Friday 12th May as we hosted the first barn disco of the year at Eastleigh Farm, by kind permission of the Hopkins family. There was a fantastic turnout for the event and all members had an enjoyable night. A friendly Tug of War competition took place before with 5 teams entering. Thank you to Kate and Rachel Hopkins, Dan Olive and their families for their hard work in hosting the event. Devon County Show took place on the 18th -20th of May with many members entering various classes. The club�s promotion board came 4th out of 20 entries and the club cubicle with a theme of �Around the World� came 14th out of 40. Well done to all those involved. Sarah Broom won the H. Samuel Cup for best Overall Club Floral Exhibit having received the full 50 marks for her arrangement. Sarah also won the 21 and over floral class which means she will represent Devon at the National Finals at Malvern Show in September. Well done Sarah and good luck for September! Well done also to Michelle Allen who won the Senior Textile Cup! Over 30 members attended the Devon County Show Dance on Saturday 20th May at Matford Centre, Exeter. A good time was had by all. The club have celebrated their 70th Anniversary in June by holding an anniversary ball and celebratory lunch. The club are delighted with the support they have received from the local communities to both events. A full report on the weekend will follow next month. 11th August: Yarcombe YFC presents their Annual Foam Party at Hill Shed, Stockland Hill, by kind permission of the Broom family. More details to follow! April has been a busy month for the young farmers, starting off with the annual ploughing match on the 17th April. 14 members took part with many members attending the event. Peter Grabham won the novice class and was named overall champion, so well done Peter! Thank you to our judges Mr D Hurford and Mr Jenkins, Arnold Dare for allowing us to use the field and all the members who helped organise the event. 40 members travelled down to Torquay on the 21st-24th April for the National Young Farmers Annual Convention. Over 5,000 young farmers from across the county attended, with many events taking place over the weekend. Evening entertainment included a fancy dress theme of �Prince and Princesses�, a club shirt night and Radio 1 DJ�s Scott Mills and Chris Stark. All members had an very enjoyable weekend and are looking forward to next year�s event in Blackpool. The club also held their annual show and sale at Sedgmoor Auction Centre on Saturday 29th April. There was a fantastic turn out with members entering British Blue Cross Steers and ewes and lambs. Twelve members showed their British Blue Cross Steers with Liam Dare�s steer awarded Champion and Oli Hine�s winning best presented. Twenty-eight members showed their ewes and lambs with Paul Doble winning Best Pen of Ewes and Lambs and Fiona Laramy awarded with best presented. The Overall Champion of the Show and Sale was awarded to Paul Doble�s ewes and lambs. Friday 23rd June: 70th Anniversary Ball at Hugginshayes Farm, Upottery. 8pm to late, dancing to The Lateshift, and Your Perfect Night Disco. Buffet, photographer and welcome drink included. Tickets �25, rising to �28 from 1st June. Booking forms available from Kate Hopkins on 07746820319 or from the Facebook page. Sunday 25th June: 70th Anniversary Past, Present and Future members lunch. A celebratory lunch for all members, family and friends of the club, 11.30 for 12pm start at Hugginshayes Farm, Upottery. A two course sit down lunch, with speeches and activities to mark the occasion. Adult tickets �15, Children aged 11-14 �10, Children 5-10 years �5 and under 4s free. There will be children�s activities and games throughout the event. Booking forms available from Sarah Broom on 07557514453. The start of Spring has been a slightly quieter period for the Young Farmers with the main event being the East Devon Stockjudging day. Practices for both beef and sheep were held for members leading up to the event with James Burrough kindly taking the time to teach members. The actual Stockjudging day took place on the 2nd April. Participating members did well with all of them gaining places so well done to Peter, Jack and Matt. Also, well done to Liam Dare who came first in the dairy class, and came second in lambs, rams, pigs and beef classes which meant overall he won the overall senior points cup. Members have also been participating in pub sports over the last few weeks. Skittles, darts and pool matches have taken place against other East Devon clubs. Currently the teams have experienced mixed results but seem to be improving with each game played. On the 5th April, 50 members went down to the new Halse South West site and were treated to a tour around the new buildings. The tour was very informative and insightful, and members thoroughly enjoyed their evening. Friday 23rd June: 70th Anniversary Ball at Hugginshayes Farm, Upottery. 8pm to late, dancing to The Lateshift, and Your Perfect Night Disco. Buffet, photographer and welcome drink included. Tickets �25, rising to �28 from 1st June. Booking forms available from Kate Hopkins on 07746820319 or from the Facebook page. TICKETS ON SALE NOW! Yarcombe�s sporting success has continued into Spring, with the ladies and men�s 5 a side football teams competing at the Devon Competition round on Sunday 26th February in Okehampton. Both teams convincingly won their respective tournaments and were named Devon YFC champions. Unfortunately the girls� competition did not go any further, but the boys� competition continued to South West Area. This competition was held on the 4th March in Newquay, where the boys won the tournament and became �South West Area Champions�. Well done to all those involved and good luck for the national round taking place later this year. The club had a visit from the Bishop Robert Attwell of Exeter on Monday 27th February. Members met the Bishop at Wellhayes Farm, Cotleigh and had a farm tour and lunch before discussing the current issues facing farming today. Thank you to the Broom family for hosting the event. The club felt very privileged to be the only young farmers club chosen in Devon to host the Bishop during his tour and members enjoyed their day. On the weekend of the 3rd-5th March, over 40 members travelled down to Newquay to attend the fun-packed South West Area Activities Weekend. As well as competing in the football tournament, some members attended an insightful Agri forum discussion. The first night was a black tie event and the Saturday night was �animals� themed fancy dress event. An enjoyable time was had by all members and members are now looking forward to the National AGM taking place in April. The new year has continued to be busy for young farmers with plenty of activities taking place. Firstly the club held a whist drive on the 21st of January at Yarcombe Village Hall. Members were given a practice session a few weeks before in preparation. The whist drive was well attended with over 80 people playing. Brian Denslow took first prize for the Men�s Whist and Susan Parris took first prize for the Ladies. The East Devon Entertains Competition took place on the weekend of 27th and 28th of January at Exmouth Pavilions. The club came a brilliant third place with their performance of �Saved By the Bell�. Liam Dare was also nominated for Best Actor and Fiona Laramy nominated for Best Actress. A massive well done to the cast and backstage crew and everyone else involved! The weekend also saw the results of East Devon Junior Member of the Year with Peter Grabham coming joint third. The conclusion of Senior Member of the Year also took place on the Saturday night with on stage interviews. Liam Dare represented the club and came second in the competition. Congratulations to both Peter and Liam! We held a rerun of our entertains on the 5th February at Axminster Guildhall. The event was well attended and guests enjoyed extra entertainment as Yarcombe did their very own version of �Mr and Mrs�. On the same day, East Devon held their 5 a-side football competition. Both Yarcombe�s boys and girls teams came first and now go onto county round in a few weeks time so good luck to all those involved. February marks the start of the East Devon pub sports competitions. In preparation over 30 members attended the club�s skittles throw off at the Sidmouth Arms on the 14th January. Teams were selected on the night and are now awaiting their upcoming fixtures. Pool and Darts throw offs are to take place shortly. Upcoming Events: For more information about Yarcombe & District YFC contact our Chairman Liam Dare on 07854404821 or our secretary Sarah Broom on 07557514453. The Christmas period was a particular busy time for young farmers. The events started with the club Christmas meal attended by 36 members at the York Inn on 6th January. This was followed by the annual Christmas Meeting on the 12th December. Members took part in decorating yule logs, creating Christmas cards and auctioning them all off for our chosen charities. On the 16th December several members visited 6 local pubs, participating in carol singing and entertaining the locals, again raising money for our chosen charities which are the neonatal units at both Exeter Hospital and Musgrove Park Hospital, and Over the Wall. December also saw over 100 members travel down to the Matford Centre for Devon YFC Christmas Ball on the 17th. 50 members also went to Marshwood Ball at Freshwater Beah Holiday Park on the 23rd of December. As we begin the New Year the focus for many members is the preparation towards the East Devon Entertains Competition at the end of the January. 5th February Yarcombe YFC presents a re-run of �Saved by the Bell!� and �Mr and Mrs� at Axminster Guildhall. Tickets on the door, curtains up at 2.30pm. 23rd-25th June SAVE THE DATE: Yarcombe YFC 70th Anniversary Weekend of Celebrations. 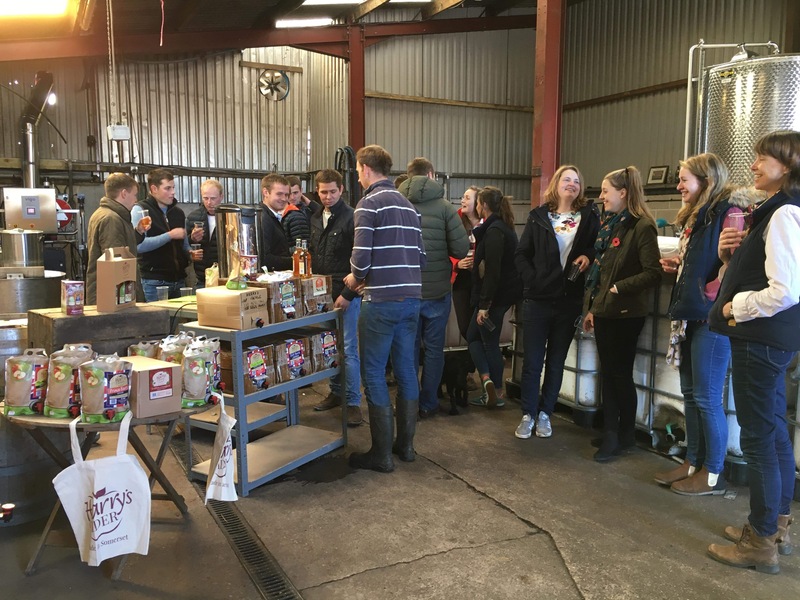 Yarcombe Young Farmers have had a very busy November with various events taking place. Firstly, a bus full of members went to Cheltenham races on the 13th of November, not everyone came back in the money but a good time was had by all. Yarcombe�s Netball Team competed at the Devon round on the 20th of November. The girls came a brilliant 3rd, a pretty good effort considering they all attended Somerset Ball the night before. On the 26th of November, we hosted our annual Wine and Wisdom at Yarcombe Village Hall. With 24 teams competing and plenty of wine consumed it was Rachel Tucker�s team who were victorious for the second consecutive year! Members have also been busy taking part in a foot trimming course, 10 members have attended the course in the last few weeks in association with the Laura Persey Trust. As we approach Christmas, the young farmers calendar intensifies with entertains practices, Christmas meal, turkey plucking, carol singing, Devon Ball and Marshwood Ball all taking place in the next few weeks! October has continued to be a busy month for young farmers with both sport and speaking competitions. Firstly, Yarcombe had a team participate in the Devon YFC Mixed Hockey Competition on Sunday 9th October. This was followed by an After Dinner Speaking Competition on the 19th October. The team consisting of Andrew, Liam, Lydia, Emma and Robert came 3rd with Andrew winning best male speaker. The club then held their Autumn Disco at Stockland Village Hall on the 21st of October. The disco was well attended and a good night was had by all. On the 30th of October, Yarcombe had two teams participate in the East Devon Netball Competition. Both teams played extremely well coming first and third. The team will now go on to represent East Devon at County Round in a few weeks� time. Lastly, over the past year, the club has been raising money to support two local charities and on October 24th we officially presented our donations. We managed to raise �3,500 for Somerset and Dorset Air Ambulance and �2,500 to Devon Young Farmers to help fund the new rural hub for future young farmers. We would like to thank all members, family and friends for their continued support and for helping us raise this money. The arrival of Autumn signalled the start of a new young farmers� year, with the AGM taking place on the 26th September. As new officers were elected, Liam, Sarah and Antony took over as Chairman, Secretary and Treasurer respectively. We would like to thank Martin, Kate, Morris and their team for a great year and wish the newly elected officers a successful year ahead. Over the last few weeks� members have been busy participating in speaking competitions including Just a Minute, Call My Bluff and Brainstrust. Our teams have all performed well with Jacqui, Andrew and Liam winning the group round of Call My Bluff. Jacqui and Andrew were also selected to represent East Devon for Just A Minute so well done to them! We held our annual new members meeting on the 10th October, where we welcomed several new faces to the club. Alongside playing numerous games, we informed the new members about who we are as a club and the forthcoming YFC activities. Saturday 26th November: We will be hosting a Wine and Wisdom at Yarcombe Village Hall, 7.30pm for 8pm start. Teams of 6 and no under 18s, to book a table contact Kate on 07746820319. Save the Date: Yarcombe YFC have reached their 70th year and to celebrate there will be a weekend of celebrations on 23rd-25th June 2017, with more details to follow in the new year. We held our annual water party on Friday 12th August at Hoemoor Farm, Upottery by kind permission of Mr and Mrs Phillips. We held TOW first; there was a bar, BBQ and lots of water. A massive thank you goes to all the members and advisory for all their help. Everybody had a fun filled evening. Our Harvest Supper is going to be held in Stockland Village Hall on Sunday 25th September at 7.30 for 8pm. On Monday 26th September we will be holding our club AGM where we look forward to members taking on their new roles for the forthcoming year. Our new members meeting is being held on Monday 10th October at 8 o�clock in the Manor Rooms, Upottery. Please come along to see what young farmers is all about! For more information about Yarcombe & District YFC contact our Chairman Martin Phillips on 07846786205 or our Secretary Kate Burrough on 07513573235. We held a charity bed push on Saturday 16th July. Members set off at 2pm at The Howley Tavern pushing their beds to The Flintlock, then onto The Candlelight and The York, finishing up at The Sidmouth Arms at 7pm. We had a tour of Ford Abbey Goat Farm on Thursday 28th July which was very interesting. On Sunday 31st July, we organised charity ferret racing. There was a great turn out and everyone had a fun time. Thursday 4th August was the day of Honiton Show. Both the boys and girls tug of war teams pulled at the show, both coming a fantastic 2nd. Our club cubicle was placed 3rd and both our club scrapbook and promotional board came 2nd. A massive well done and congratulations goes to all members who represented Yarcombe YFC at the show where we came 2nd in the club with most points. Summer is now in full swing with Tug of War and barn discos most Friday nights. We held our annual foam party on Friday 1st July at Harrisons Farm by kind permission of Mr and Mrs Perry. Tug of War was held first with many boy and girl teams competing from clubs around Devon. A massive thank you goes to all members and advisory with the preparation of the shed, BBQ and the bar. The night was well attended and a fantastic night was had by all. After our club meeting on Monday 4th July at Harrisons Farm, we had a club social evening full of fun and games and a BBQ. We have many events to look forward to over the next couple of months including a charity bed push, charity ferret racing, our annual water party and Honiton Show. On Saturday 14th May, we held our community project. Members went down to Upottery churchyard where they helped with trimming trees, standing gravestones up and gave the churchyard a general tidy up. Devon County Show was held on 19th to 21st May. The club entered a club scrapbook which came 6th out of 31 and a club cubicle with the theme of �My Favourite Place� which came 12th out of 31. Both the boys and girls Tug of War teams went down to the show on Saturday and pulled against clubs from around Devon. The Saturday evening was the Devon County Show Dance, where members filled a bus and went down to the Exeter Livestock Centre and had a fun evening. There are many exciting events coming up over the summer, like our annual foam party on Friday 1st July and the Devon YFC paint party on Saturday 30th July. With summer approaching, members have been very busy with many events and competitions. On Wednesday 20th April some members enjoyed an evening at AirHop in Bristol. Everyone enjoyed themselves but were exhausted by the end of the evening! We held a disco on Friday 22nd April at Stockland Village Hall with a theme of �Royalty� celebrating the Queen�s 90th birthday. Our annual Show and Sale was on the Saturday 30th April at Sedgmoor Auction Centre. There was a fantastic turn out with members entering British Blue Cross Steers, pigs and ewes and lambs. Thirteen members showed their British Blue Cross Steers. Oli Hine�s steer was awarded Champion and Tom Hine�s won Best Presented. This was the second year that pigs were entered into the Show and Sale. Nineteen members entered their pigs where Best Pair of Pigs was won by Jack Burrough and Best Presented was won by Kate Hopkins. Twenty-one members showed their ewes and lambs. Kate Hopkins� won Best Pen of Ewes and Lambs and Best Presented was won by Sarah Broom. The Overall Champion of the Show and Sale was awarded to Kate Hopkins� ewes and lambs. The cast and crew made their way to Cheltenham on Sunday 20th March to perform �Weevils in my Biscuits� in the Southern Area round of drama performances. They did their best ever performance and came a fantasic 3rd! A massive well done to the cast and everyone involved. Also, a big thank-you goes to all family and friends for their support and help over the last few months whilst we have been practising and performing. On Sunday 10th April we had a very successful day Stock Judging against other clubs in East Devon. We came second, so well done to all members who took part. We have some very exciting events coming up including AirHop in Bristol, our �Royalty� Disco at Stockland Village Hall on the 22nd April, celebrating the Queen�s 90th birthday, and our annual Show and Sale held at Sedgmoor Livestock Market on Saturday 30th April. After winning the East Devon round of drama performances, Yarcombe YFC went on to represent East Devon in the Devon Round on the 14th February at The Palace Theatre, Paignton. They performed against other winning clubs of Devon. Fantastically we won!! We then had our re run of our drama performance at Axminster Guildhall on Sunday 28th February. It was lovely to perform our winning performance in front of local people. Following the performance we held an auction of promises, items included were, one cake a month for a year, a cream tea for two and a floral bouquet. The auction raised a brilliant �1,709 for our charities this year. A massive thank you goes to Will Wallis of Greenslade Taylor Hunt for auctioning off all the items for the sale, to the companies and members who donated items for the auction and to everyone who helped out on the day. The South West Area activities weekend was held between the 4th and the 6th March in Weymouth. A total 43 members went up for a fun packed weekend and all had an enjoyable time. The first night was a black tie event and the Saturday night was a �bright and tight� silent disco. The weekend also included sport, public speaking, debating competitions and the drama competition. This is where we represented Devon and came 2nd. 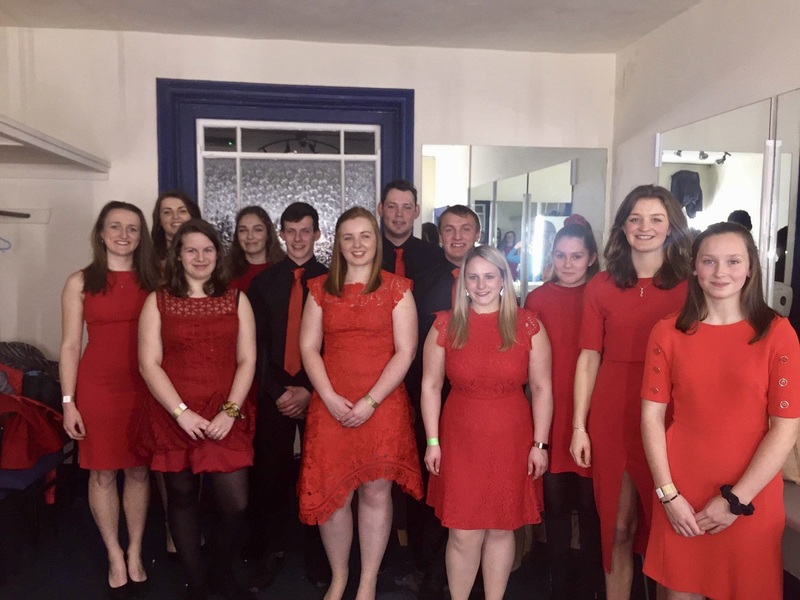 We now go onto represent the South West Area, alongside the winners Somerset YFC, at the Southern round held at the Bacon Theatre in Cheltenham on Sunday 20th March. Good luck to cast and everyone involved for the next round. Two of our members, Will Dyer and Morris Burrough, are taking on the challenge of the �Tower to Tower� Cycle Ride along with fellow Somerset YFC member Josh Fincham. The challenge involves cycling 600 miles from The Eiffel Tower in Paris to The Blackpool Tower. They are setting off on the 1st May from Paris and are set to arrive in Blackpool on the 4th May in time for the National YFC AGM weekend. Will and Morris are raising money for Cystic Fibrosis and any sponsorship would be greatly received. Please contact our Chairman or Secretary for more information. With the nights drawing out, we are looking forward to the Spring and the events ahead. We held our Whist Drive on Saturday 23rd January at Yarcombe Village Hall. A total of 92 people attended, and a fun evening was had by all. The East Devon round of drama performances was held on Friday 29th and Saturday 30th January at Exmouth Pavilions. We performed on the Friday night, and the results were held on the Saturday night. Yarcombe YFC was placed first with our performance of �Weevils in my Biscuit�. Congratulations go to our cast Cathrine Phillips, Jacqui Manning, Elsie Stacey, Robert Dyer, Andrew Dyer, Liam Dare and Winston Perry, to our director Sam Parris and to everyone else involved. We now go on to represent East Devon at the County round on Sunday 14th February. We will be doing a local re-run of our drama performance, and we will also be holding an auction of promises to raise money for our chosen charities after the performance. This will be taking place on Sunday 28th February at Axminster Guildhall. Finally, congratulations go to Jacqui Manning who came 3rd in Senior Member of the year at the East Devon round. The next event we are looking forward to is the South West Area weekend held in Weymouth in March. It is a fun filled weekend full of social, sports and competitions. December has been a very busy and fun filled month! It started off with the Christmas meeting on the 7th December. After the meeting, members took part in Christmas crafts, which were auctioned off raising money for our charities. On 10th December the club went turkey plucking at the Hines� family farm. We managed to pluck 88 turkeys! 97 members travelled down to Westpoint in Exeter for the annual Devon Christmas Ball. It was a good night and got everyone into the Christmas spirit. Our Christmas meal was held on Wednesday 16th December at the Sidmouth Arms where 60 members enjoyed a 3 course meal. A massive thank you goes to the Sidmouth Arms for the fantastic food. On the 18th December the club went carol singing. Members started at the Howley Tavern and then onto the Eagle Tavern, the Candlelight Inn, the York Inn and finished off at the Sidmouth Arms. A brilliant �342.82 was raised for our charities this year. There was some great fancy dress, including a well thought out nativity scene! On Friday 29th January, the club will be performing our drama performance at Exmouth Pavilions. We will be doing a re-run of the performance at Axminster Guild Hall on Sunday 7th February. We will also be holding an auction of promises. For more details please contact Martin or Kate. For more information about Yarcombe & District YFC and our upcoming events, please do not hesitate to contact our Chairman Martin Phillips on 07846786205 or our Secretary Kate Burrough on 07513573235. 42 members travelled up to Cheltenham on the 15th November for the annual Young Farmers� race day. A fantastic day was had by all, even though most lost their bets instead of winning them! On the 22nd November, Yarcombe YFC represented East Devon Young Farmers in the Devon county netball competition held at Clyst Vale Community College at Broadclyst. The girls played excellent and came in 3rd place. We will soon be in full swing for drama competition which we will perform at Exmouth Pavilion in January. December looks to be a busy month with lots of Christmas activities to look forward to including the annual Christmas Devon county ball, our annual carol singing on Friday 18th December and our Christmas meal at the Sidmouth Arms. For more information about Yarcombe & District YFC and our upcoming events, please do not hesitate to contact our Chairman Martin Phillips on 07846786205 or our Secretary Kate Burrough on 07513573235. The clocks have gone back and dark nights have arrived but we still have a lot to look forward this Autumn. We held our New Members meeting on the 12th October at Upottery Village Hall. It was a fun filled evening where our members, new and current, took part in games. Sarah Broom and Cathrine Phillips went to Exeter Cathedral on the 24th October to help decorate two pillars for the Harvest Festival. The girls did an amazing job along with other members from East Devon Young Farmers ready for the service the next day. Our annual Wine and Wisdom was held on Friday 30th October. Once again, it was a great evening, and we had 32 teams enter from the local area and surrounding Young Farmers Clubs. It was a great evening full of wisdom and a lot of wine! Thank you to Roger Patch for being our quiz master and to Cathy Derryman for writing this year�s quiz. 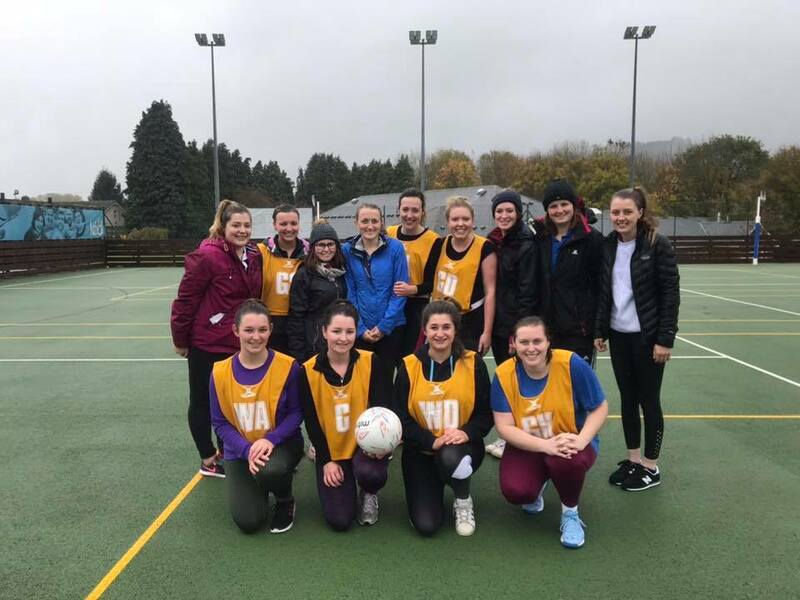 Yarcombe & District YFC began November with a fantastic win in the East Devon Group round of Netball, for the second year running! Well done to all the girls that took part! Our team will go on to represent the East Devon Group at the Devon round on the 22nd November. We have many other things to look forward to in November including a day at Cheltenham races and Devon YFC ice skating. For more information about Yarcombe & District YFC and our upcoming events, please do not hesitate to contact our Chairman Martin Phillips on 07846786205 or our Secretary Kate Burrough on 07513573235. The Devon County Brainstrust round was held on 10th September. Massive congratulations go to Cathrine Philips along with members from Whimple & Broadclyst YFC, who represented the East Devon Group and became Devon Champions. Morris Burrough, Emily Hall, Lauren Doble and Michelle Allen took part in the 3 Peaks Challenge on the 19th September. They all completed the challenge in less than 24 hours. A huge well done goes to them for this achievement. On the 20th September, we held our annual harvest supper. Pete O�Malley from Farm Vets South West was our guest speaker for the evening. Andrew Dyer, our Chairman of 2014/2015, did a great speech, and so did Martin Phillips, our Chairman for the forthcoming year. It was the perfect event to round up the Club�s fantastic year of activities and achievements. Members were awarded with trophies to mark their effort put into the Club and a huge thank you must go to all our Officers for their hard work during the past year. We would also like to say a big thank you to Becca Laramy for organising the Harvest Supper, and to Karen Laramy, Sarah Olive and their team for the superb food. The evening was enjoyed by all. Our annual AGM took place on the 28th September at Yarcombe Village Hall where our new officers were appointed. 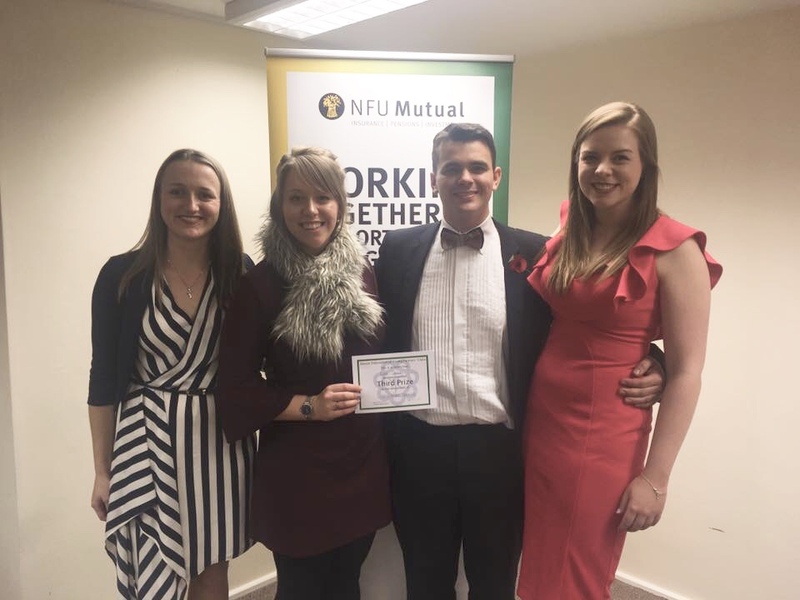 Good luck to Martin Phillips, Kate Burrough, Morris Burrough and their team for the forthcoming Young Farmers� year. Our New Members Meeting takes place on Monday 12th October at 8pm at the Upottery Manor Rooms. We look forward to welcoming new members to our Club. Also, our annual Wine & Wisdom takes place on Friday 30th October, which many members are looking forward to. We held our annual water party at Hoemoor farm Upottery on the 21st of August by kind permission of Mr and Mrs Phillips. It was a great evening with TOW first and a BBQ followed by lots of water, thank you to all the members and advisory who helped before and during the event. Public speaking season is now under way starting with Intermediate Brainstrust, it was held on the 25th of August, with 2 teams competing. Yarcombe B came 3rd and Yarcombe A came 5th. Well done to all that took part and good luck to Cathrine Phillips who will be going through to the county round. Our fancy dress raft race was held on Sunday 30th of August starting at Whitford Green, we had 12 teams competing for the title. Coming in first was Peter Sweetapple, Rowan Short, Harry Parr and Jonathan Christopher from Axminster YFC only taking 51 minutes to finish. Pipped at the post were Yarcombe boys, Andrew Dyer, Ryan Dobson and Craig and Antony Edwards. In 3rd place were Gavin Herrod, Jack Chapple, Simon Herrod and Jon Turner also from Axminster. Best raft was won by Phillip and Daniel Johnson, Lawrence Gay and Mike turner from Axminster. Yarcombe girls won the best fancy dress with their flower power theme so well done to Alice Quick, Cathrine Phillips, Emma Dyer and I. Members as usual have been attending lots of events this month including Culm valley ball and Devon YFC foam party which were very much enjoyed. Our Harvest super is being held at Yarcombe hall on the 20th of September where we celebrate the harvest and our achievements in the past year. Our club AGM will take place on Monday the 28th of September where we say thank you everyone who have contributed this year and look forward to members taking on new roles for what hopes to be another great year ahead. Our new members meeting is Monday 12th October at the Manor rooms Upottery, please come along and see what it is all about. For more information about Yarcombe & District YFC or about our upcoming events please don�t hesitate to get in contact with our chairman Andrew Dyer on 07704840677 or Secretary Jenna Pearce on 07786398850. Our summer is continuing to be busy with many events happening. We held our annual foam party on the 10th July at Andrews, Glebe farm by kind permission of Mr and Mrs Dyer. We had lots of girls and boys teams competing in the tug of war, we also had a BBQ, thank you to all members and advisory who helped on the night and before the event. A great night was had by all. On the Sunday we held a social evening with Marshwood Vale Young Famers also at Andrews, we had a good game of rounders and football followed by a bar and BBQ, lots of members from both clubs attended the event. 7 Yarcombe girls ran the 5k pretty muddy race for life in Exeter on the 25th of July raising money and awareness so well done too Kate, Lucy, Emma, Laura, Cathrine, Emily and Kate. On the 30th 23 members collected there 5 YFC sheep, so next year�s show and sale should be a good one. We held our charity duck race on Monday 3rd august at Sheafhayne Manor by kind permission of Mr and Mrs Parris. We had a great turn out of all ages with especially the children enjoying watching the race. We sold all our ducks making �1,347 for Prostate cancer and hospice care South West. It was a great evening so thank you to everyone who attended. Yarcombe YFC members this year took on the rains and ran the bar at Yarcombe Terrier Races. We made �1,000 profit which will be split between Yarcombe church and our chosen charities this year. Many members entered different classes into the Honiton show young farmers tent. This year�s theme for the club cubicle was 125 years of farming so well done to Fiona and her team for coming 2nd overall. We also entered a promotion board which came first overall. Liam Dare won the cup for most points awarded for senior boy so a big well done to him. We have had a great summer this year attending many Yarcombe YFC weddings with Mr & Mrs L Burrough, Mr & Mrs H Moss, Mr & Mrs J Hutchings and Mr & Mrs J Cottey all tying the knot in 2015. There is just one to go with Sarah Dyer marrying Matthew Morgan in September. Yarcombe YFC would like to wish them all the best of luck in the future. The summer season of Tug of War is now in full swing. We have been attending TOW most Fridays including Honiton Neon barn bash and Devon�s powder paint party. We had the opportunity to go on a farm tour at Neil bakers dairy farm near Crewkerne, 30 members attended, we all had an interesting and informative afternoon. Axminster young farmers held the �Axe challenge� we had four teams competing with Jack and Scott Burrough, Oli Hine, Bill Morgon coming first. A big well done to the boys! Yarcombe girls are once again taking part in the Race for Life. If you would like to sponser us, any donation would be much appreciated, the link is on our Facebook page.